Serving the Monterey Peninsula for over 65 years! Whether your looking into a single baseboard heater or a 96% efficient forced-air split system with multiple zones and an outside air kit your search ends here. We’ve installed well over a thousand heating systems since we’ve gotten into this business and we would like to do another one for you. 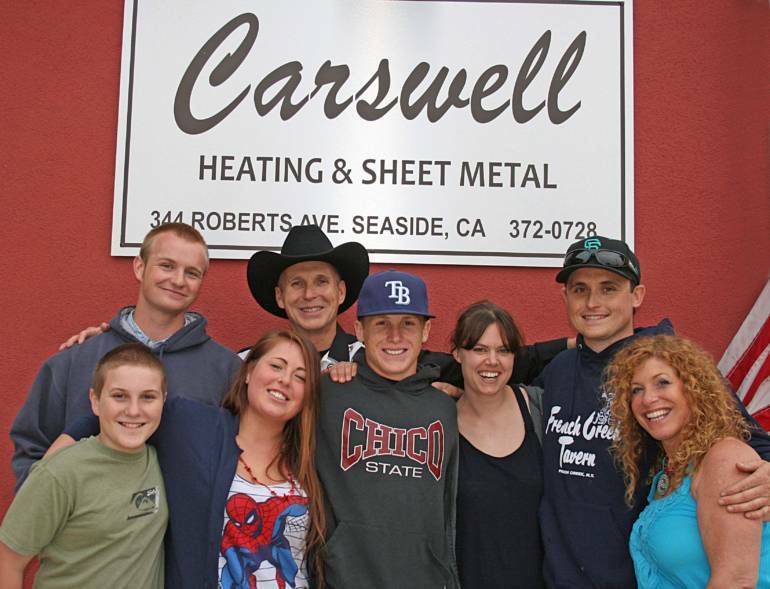 Whether your heating system is suffering from a minor hiccup or needs a complete overhaul Carswell Sheet Metal can meet your needs and exceed your expectations. We’ve been servicing, repairing and rebuilding furnaces in the Monterey Bay area since 1948. Our knowledge of heating and cooling equipment is vast and there isn’t a major brand we don’t have experience with. No matter what type of forced air, hydronic, wall-mounted or electric heating you have in your house the chances are very good we can fix it or find a suitable and cost effective replacement. Our current rates are $119/hr plus travel one direction for repair work and there are no truck charges, gas surcharges etc. For a simple repair or relatively minor issue it isn’t uncommon for us to address and repair the problem on the first visit. Very, very few shops can honestly say that for a couple of reasons. There has been a disturbing new trend in the HVAC industry called “flat rate pricing”. This is often advertised via statements such as “no hourly charges” or “pay by the job, not by the hour”. Sound attractive? Think again. This business practice uses what is colloquially known as “book time” which means however long it says in the book is how long they charge for – except the book times are almost always significantly longer than the job actually takes. Auto mechanics have used this type of billing practice for many years. This allows technicians to create 12-16 billable hours in a typical 8 hour work day. And the customer is the one who ends up paying for it. We believe in only charging the customers for what they get. We aren’t interested in charging somebody for 4 hours through a flat rate system when the job only takes an hour and a half. It isn’t good for business, it isn’t good for our customer and it certainly isn’t good for our reputation. Another unfortunate new trend in the HVAC service industry is technicians that are paid by commission. Many local shops have technicians that make a low hourly wage but receive half of their total sales in commission. This creates a very obvious conflict of interest. No technician paid by commission is going to simply diagnose and fix a minor problem on your heating system and then leave 45 minutes later and charge you for 1 hour of labor. It just isn’t going to happen. In 90% of cases they are going to recommend additional replacement parts or unnecessary cleaning, refuse to fix the unit and insist it needs a total replacement, try to get you to sign some sort long term service agreement or in some cases even lie and say that some of the parts are defective or malfunctioning when that isn’t the case. It is unfortunate but it is becoming increasingly common. At Carswell nobody is paid by commission. We pay our employees by the hour which ensures that our customers get what they need and only what they need. We pride ourselves on being able to accurately and quickly create an estimate for any extensive repair work or replacements. We can do this because we have extensive product knowledge and because we aren’t interested in selling things that our customers don’t need. We have a great many returning and happy customers that can attest to that fact. We enjoy giving our customers as many options as possible. And we believe that it is better to have 3 returning customers paying us $50 each than 1 angry customer that pays us $300 and will never call us back. One of the ways we do this is by offering conservative repair suggestions. We don’t want to reinvent the wheel on every job we go to and because we have such a high percentage of returning customers we don’t have to. A simple problem needs a simple solution and a more complex problem needs a more complex one. It is as simple as that. We are willing to do as much or as little as our customers want and we empower them with the information to make the decision that we will work for them.